Nestled into the rocky waste of plataberget Mountain about Svalbard's airport, the Global Seed Vault is at once startling and innocuous. Designed by architect Peter W. Søderman at Barlindhaug Consulting, this concrete, steel and glass structure is the first layer of security to a repository of millions of seeds from around the world, stored here in case of disaster, disease, or war...The Svalbard Global Seed Bank is situated 120 metres (390 ft) inside a sandstone.mountain at Longyearbyen on Spitsbergen Island, in the Svalbard archipelago about 1300km from the North Pole. Svalbard was considered ideal for the bank, due to low tectonic activity and its permafrost, which will aid preservation. Even if sea levels rise due to climate change - and the melting of ice caps, the seeds will be safe and dry , as they are stored at a location 130 metres (430 ft) above sea level. 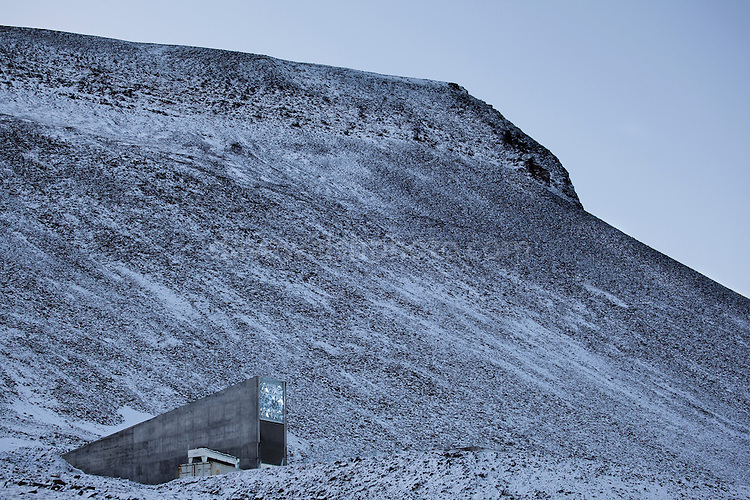 ..The Svalbard Global Seed Vault provides a safety net against accidental loss of diversity from traditional storage within genebanks around the world, and has a capacity for 4.5 million seeds. Although the media has made much of the "Doomsday Vault's" role in providing security in the face of war or or catastrophe, the operators - the Norwegian government and the Global Crop Diversity Trust and the Nordic Genetic Resource Center - say that it will be most useful when genebanks lose samples due to mismanagement, accident, equipment failures, funding cuts and natural disasters.